These artists only work with the finest supplies. They know that in a pet care facility, there are several commercial veterinary flooring challenges to overcome. 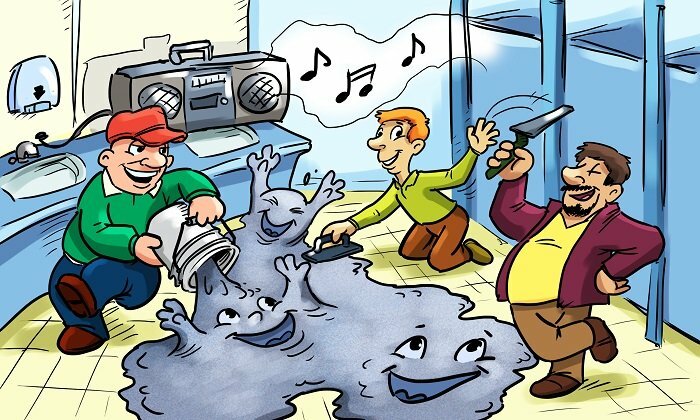 First, you will want to ensure that your floors minimize the spread of bacteria. With all of the sick animals coming in and out of your establishment, an epoxy floor that traps dirt and bacteria can mean the end of your business. You will want a commercial veterinary flooring system that is easy to clean. That means no crevices, cracks or grooves, and specifically, you will need a floor that is urine resistant. Urine contains a lot of ammonia and will stain other non-epoxy floors. You will also want a durable floor: one that can withstand the impact of your equipment, foot traffic, as well as cats claws and dog nails. Most importantly, you will want epoxy flooring that looks good! Our resin based epoxies seep into the concrete floor like water seeps into a sponge––and then the resin hardens to literally become a part of the concrete floor. That means it won’t peel off or flake or chip. The epoxy coat covers seamlessly and it is 100% non porous––there’s absolutely nowhere for dirt and bacteria to go, so it gets wiped right off. You also have a fair amount of flexibility in terms of the look and feel. We have many colors to choose from, as well as metallic, quartz and logo designs available. The best part is, our epoxy flooring is extremely easy (and fun!) to install. You could turn your old wore-out canvas into a new piece of fine art!